Find free printable certificates of leadership samples, templates and examples at FunAwards. 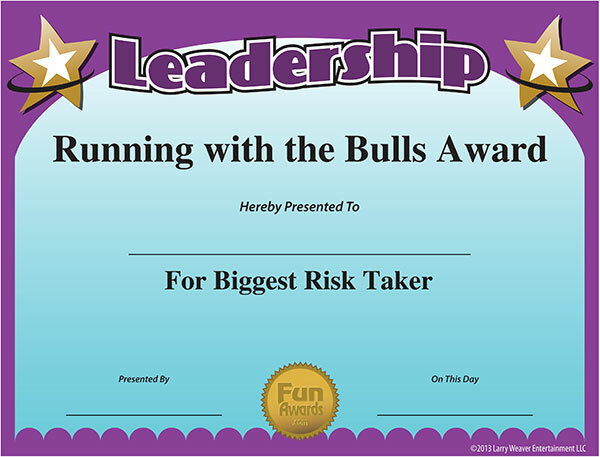 Plus blank certificate of leadership templates to make your own leadership certificates. Within every workplace, office or organization, there's one fearless leader -- a bold risk taker who isn't afraid to step out of the pack and take on new challenges. Celebrate their superior management, direction, and control with this free certificate of leadership. Each collection comes with blank certificate of leadership template in PDF format so you can add custom wording to make your own leadership certificates. If you need volunteer leadership certificates or staff leadership certificates, take a look at either collection. They both have dozens of certificates applicable to any organization or gender.